I really don't even need to write this blog because it's the same story every time. But I love it all the same. Patriots head coach Bill Belichick met the media in his training camp-opening press conference earlier this morning and dodged, in classic Belichick fashion, questions about things that don't matter anymore. The highlight of the session was when the Boston Globe's Dan Shaughnessy went after him about not playing Malcolm Butler in Super Bowl LII. Shaughnessy: Bill, I know you're all about this year, but I wouldn't be doing my job if I didn't ask about last year. Belichick: Last year is last year. I'm not focused on that. Shaughnessy: What about the fact that everywhere we go, folks want to ask about Malcolm Butler. Sports. Coaches. Players ... You're a sports fan. Belichick: We've talked about that multiple months ago. Shaughnessy: Is there going to be any more explanation about why he didn't play? Belichick: I'm focused on training camp. Shaughnessy: Would you do it any differently? Belichick: Training camp? We're going to start and work on that right now. We're going to do the best we can. Shaughnessy: Does it matter to you, do you care, that the fans want to know more about this? Belichick: I'm focused on doing the best I can for the 2018 New England Patriots. That's my job, that's what I'm going to do. That's what I've always done in the past, every day that I've coached here, I've done the best I can for this football team and I'll continue to do that. Right now, my focus is on the 2018 season. Not 2017. Not 2014. Not 2007. Not 2004. Not 2001. Not 2000. I'm not focused on any of those seasons. They're done. Shaughnessy: For this season's team, is it important for you to address the Malcolm Butler thing with your team? Belichick: It's important for me to have a good season in 2018. I'm going to do everything I can to do that, to do the best I can for our football team. That's my job, that's my responsibility, and that's what I am going to try to do. Hopefully you can respect that, but maybe not. I get that people want to know about this and don't disagree with those who say the fans deserve an explanation, but it doesn't feel like it's worth caring about anymore. The Super Bowl was months ago and there's nothing that can be done about any of it now. 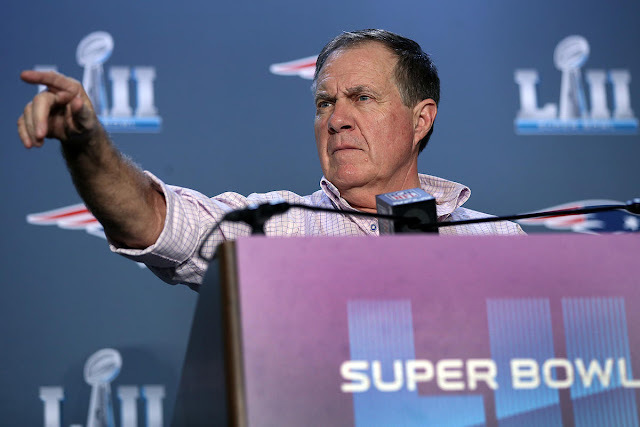 There's no point in asking Belichick a question we know he won't answer. I don't want to talk about things that happened last season. I want to talk about this season and get excited for what should be another fun year. Moving on, Belichick was also asked about Julian Edelman's suspension and voiced his disappointment. A few other nuggets include Belichick not biting on speculation that Malcolm Mitchell was on the trade block, and his weird answer when asked whether or not he texted Jimmy Garoppolo after each of his 49ers wins. Belichick never flat-out denied the Garoppolo part, saying he wasn't going to talk about things that happened months ago. If Belichick actually did this, would anyone else find it weird, or is it just me?